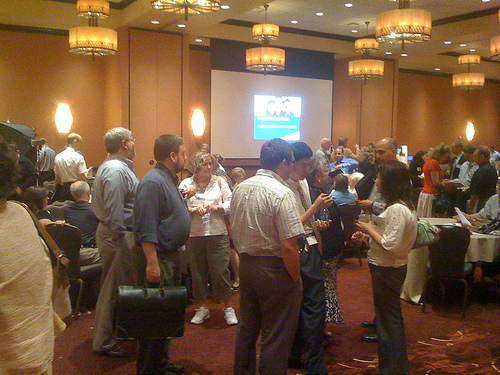 JobCamp originally grew out of a collaboration between the Wisconsin Professional Recruiters Resource (WISPRR), a local recruiter networking group, and Bucketworks, a creative/entrepreneurial/technological incubator. The first JobCamp was held in March of last year as a "camp" event (in the style of BarCamp) with 500 attendees. It started as a way to enable those with experience with the hiring process to give back to the community they saw being hit by the economic shocks. This February 25th in Milwaukee, they are expecting amazing growth of the event and 1500+ attendees. Attendance is 100% FREE and 100% volunteer run. Well over 100 speakers in both large presentations and small groups discussions will be there. JobCamp activities include practice interviews, resume reviews, speed networking, elevator pitch practice, free headshots, social media training and networking events based on industry/function. Dave Carhart, JobCamp Volunteer, told me that most people come as part of an active job search, but many come just to network or to brush up on their job seeking skills. He also said this JobCamp will have a big focus on helping job seekers with networking, social media and self-branding, in addition to resumes and interview skills. The organizing team of nearly 20 people is a diverse group. Some employed, some not, several recently re-employed (mostly through strong networking) and some students. They represent a broad range of industries--several HR & recruiters, and the core team includes project managers, graphic designers, marketing and communications/media professionals. Many have taken their own layoffs as an opportunity to share their skills in these areas. JobCamp is executed on a 0 marketing budget. The web space is donated and the primary channels are social media and word of mouth. LinkedIn, Facebook and Twitter (@JobCamp) are all huge parts of the effort. Relationships with local job seeker networking groups are key as are those with career centers (both government and school). The event is so good for the community they have received great press coverage. Watch Todd Nilson, Founder of JobCamp talk about what makes it different than a job fair. Milwaukee job seekers are so LUCKY to have this resource in their community and a group of caring and enterprising volunteers to help them. Here's a public thank you to Todd, who I had conversation with a couple of months ago. He was very kind to help me brainstorm how I could start to rehab job fairs and job seeker events in the community where I live. What are you are doing in your community to help job seekers? It has been a truly amazing experience to be involved with this effort. What's impressed me the most has been the huge community support from speakers, sponsors, all of the volunteers that run the event and everyone who has helped spread the word. I attended the first JobCamp as a recruiter looking to network and as someone who (being in the 3rd party search field) was concerned about their own situation. Once I was there and felt the energy of the community coming together I was hooked! Karla, you are so kind! I'd love it if we could roll out the JobCamp events across the country. Dave and I are looking forward to working with you as you get closer to running a new generation of career management events in your area! Karla, thank you so much for your support. The entire team has been working hard to bring Milwaukee and surrounding areas the best JobCamp yet. From a personal level, JobCamp has given me lifetime friends, invaluable professional connections, and have a sense of pride I've never felt before. That's the real power in people volunteering and working towards a common goal. We will be sure to keep you posted! @Angela – Thanks for stopping by and leaving such a cool comment – I can feel your energy and it's inspiring =) All my best at JobCamp!